The artistically designed historic United States Capitol offers a remarkable journey of discovery. Steer through this article to learn some interesting and fun facts about the Capitol. Often mistaken to be the White House by first-time visitors to Washington, the United States Capitol, or simply Capitol, is home of the United States Congress and its two legislative bodies, the US House of Representatives and the US Senate. Standing tall atop the Capitol Hill at the eastern end of the National Mall, this architecturally impressive and magnificent building is situated in Washington DC, United States. Ever since the construction of the Capitol began in 1793, it has been built, burnt, rebuilt, extended and restored several times only to present spectators with the most important federal building in America in today’s times. 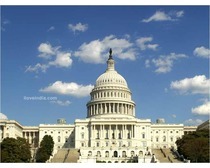 Find out more interesting and fun facts about the United States Capitol in the lines that follow. This Washington State’s Legislative Building serves as a working governmental center as well as a symbol of Washington’s free and democratic government. Rising at a height of 287 feet, this legislative building is the fourth tallest masonry dome in the world. As many as 173 million pounds of stone, brick, concrete and steel have been used in the construction of the building. The Capitol building has been divided into two wings: the north wing is the Senate chamber, while the south wing is the House of Representatives chamber. The structure of this symbolically significant building was an outcome of a design competition held by Thomas Jefferson in 1792, which was won by amateur architect, William Thornton. Initially, French architect Stephen Hallet’s design was selected, but it was later rejected on the context of being too fancy and costly. However, Hallet was appointed as the superintendent of construction. The design went under several modifications, the first being by Hallet due to the various problems. Later modifications came from Benjamin Henry Latrobe and Charles Bulfinch. While the Senate wing was complete by 1800, the House wing could only be completed in 1811. The building went under expansion during the 1850s. 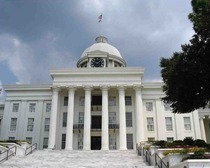 The East Front of the Capitol building was designed by architects Carrère and Hastings, who designed the Senate and House office buildings as well. The National Statuary Hall Collection housed in the building showcases two statues of notable personalities donated by each of the 50 US states. Amongst all, the most remarkable statue is a bronze statue of King Kamehameha that was donated by Hawaii. The statue that rests on top of the dome is known as ‘Miss Freedom’ that weighs 2,000 pounds and is 15 feet tall. The Capitol rests in an area of 274 acres surrounded by lawns, walkways, streets, drives and planting areas. The National Park Service declared the Capitol as a National Historic Landmark on December 19, 1960. The building ranks in the sixth position in American Institute of Architects’ list of ‘America’s Favorite Architecture’. The newest addition to the Capitol is the Capitol Visitor Center that was built in 2008. Spread across 580,000 square feet, this underground 3-level screens all the visitors through a magnetometer, before they enter the building.